The speaker said he was looking to prevent a 'spectacle' on the House floor. 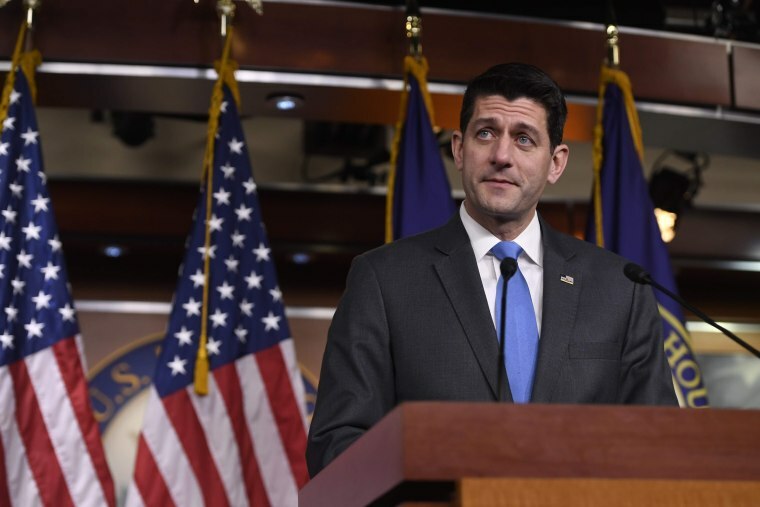 WASHINGTON — Speaker Paul Ryan on Thursday dismissed an effort by a group of House Republicans to circumvent the normal legislative process and force floor votes on a pack of immigration proposals. “We never want to turn the floor over to the minority. What I don’t want to do is have a process that just ends up with a veto,” Ryan said at his weekly news conference, after being asked about the discharge petition — a maneuver that can be used to force votes on the House floor — filed a day earlier by a group of moderate House Republicans. The Wisconsin Republican added that he doesn't want to have a "spectacle on the floor." The petition, filed Wednesday by three Republican representatives — Carlos Curbelo of Florida, Jeff Denham of California and Will Hurd of Texas — would force a vote on bipartisan legislation unveiled in March that would allow for consideration of four different proposals, including a conservative immigration bill proposed by Judiciary Committee Chairman Bob Goodlatte, R-Va.; a bipartisan version of the Dream Act; and a bipartisan bill to protect people covered by the Deferred Action for Childhood Arrivals (DACA) program while enhancing border security. It would also allow Ryan the ability to offer an immigration bill of his choosing. The effort would likely need all Democrats to sign on to the discharge petition, along with at least 25 of the 236 members of the GOP caucus. As of Thursday afternoon, 18 Republicans had signed on. "The message from the House Republicans that so far have signed the discharge petition is that we want action, that the president was right to call on Congress to act, and that we find it unacceptable that many months later, the House has done absolutely nothing," Curbelo said on CNN Thursday. Ryan said Thursday that Republicans want to solve the DACA problem and find a bill that can garner 218 votes. He said that the bill would need to be bipartisan, but emphasized that it must be one that President Donald Trump would sign.